FC Midtjylland say selling tickets for Thursday's Europa League match with Manchester United for £71 was "fair". United fans are planning to protest at the cost of admission for the first leg of their last-32 tie at the Danish champions' 11,800-capacity MCH Arena. Southampton supporters were charged £22 to attend a Europa League play-off match at the same venue in August. 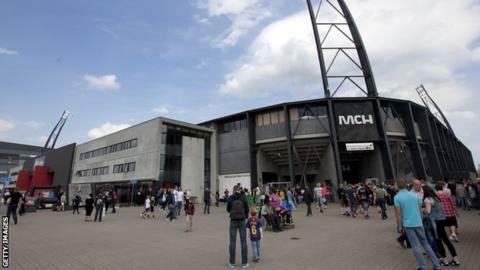 "We could have sold over 50,000 tickets," Midtjylland sports director Claus Steinlein told Ritzaus Bureau. "So, in relation to supply and demand, the price might have been even higher. "I think, in fact, we have been fair, and we've certainly had no trouble selling tickets." Chairman Rasmus Ankersen told BBC Radio 5 live he understood the frustrations of United fans but said the club had to "try to make everyone happy". He added: "It's a big game for us with a lot of demand so we feel it's important we capitalise on that. Our fans have not complained about it. "It's a lot of money but people here think this is a once-in-a-lifetime experience." A United fans' banner due to be unfurled at the game, which kicks off at 18:00 GMT, reads: "Welcome to Scamdinavia." The managing director of the Scandinavian Manchester United Supporters' Club says he supports the planned protest. Bernt Hjornevik told BBC Radio 5 live: "I've spoken to some of the Danish members about the price and they are also furious." Last week, Liverpool's owners abandoned plans for a £77 top-priced match-day ticket for next season after fans staged a walkout protest during their home game against Sunderland. The Black Cats, meanwhile, have announced reductions to their season-ticket prices for the 2016-17 campaign.